AUDUSD is under the influence of Yellen’s speech, Australia Interest Rate Statement and Home Loans report. Despite its bullish movement, AUDUSD tried to fall down a couple of times yesterday but it failed. 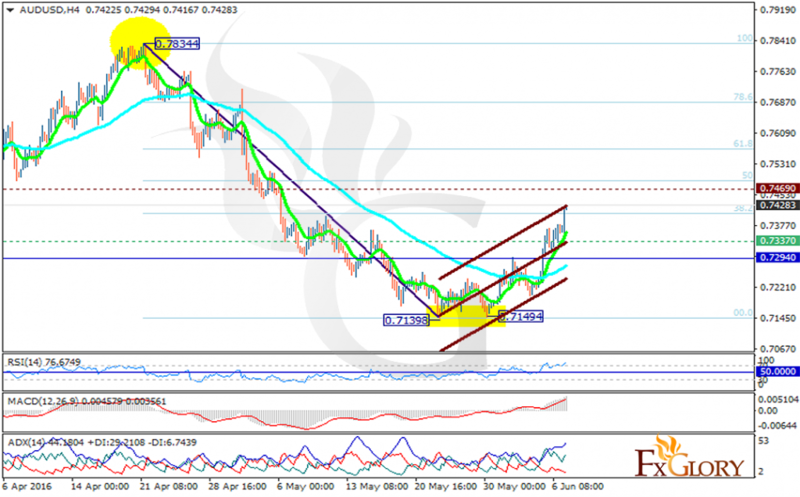 The support rests at 0.73370 with resistance at 0.74690 which both lines are above the weekly pivot point at 0.72940. The EMA of 10 has passed the EMA of 75 going upwards. All indicators are signaling price growth; the RSI is above the 50 level, the MACD indicator is in positive territory and the ADX is showing strong buyers. The pair needs to grow higher to make a reversal around the 61.8 of Fibonacci retracement. Long positions are recommended with the target at 0.75.